I had the wrong lens on my camera so I didn't get any wide angle pictures. The kitchen is going to be gutted and replaced with new everything. What do you think? Should I keep the wallpaper border? Ha! I'm not sure I can live with pink roses on the light fixtures and sparkly popcorn ceilings. Ugh. Moving is one of my least favorite things in the world. I'd rather give birth again with no drugs than pack up and move. But that isn't an option. So we move. Anyone have a magic wand they can wave and just make it all be done? oh I love love love those windows above the kitchen sink!! I can't stand a kitchen without natural sunlight. Looks wonderful! Loving the french doors and arched doorways. Some lovely features, good luck with the move! Love it! Especially the doors. You can send me the rose light fixtures. They would go well in my girls' room! looks awesome! the flowers need to go though! if you need help moving let me know. i have no truck, but i have arms and legs! Moving is a chance to "lose" stuff. Stuff that seemed important,yet creates clutter and confusion, and then once tucked inside a cardboard box to be moved proves it isn't necessary to my life at all. And that is when I have chosen to keep it from taking up space in my new home. Each time I have less, I realize that in fact I have more. More of everything that is important. Your new home, farm, looks enchanting. Looks like a nice house. 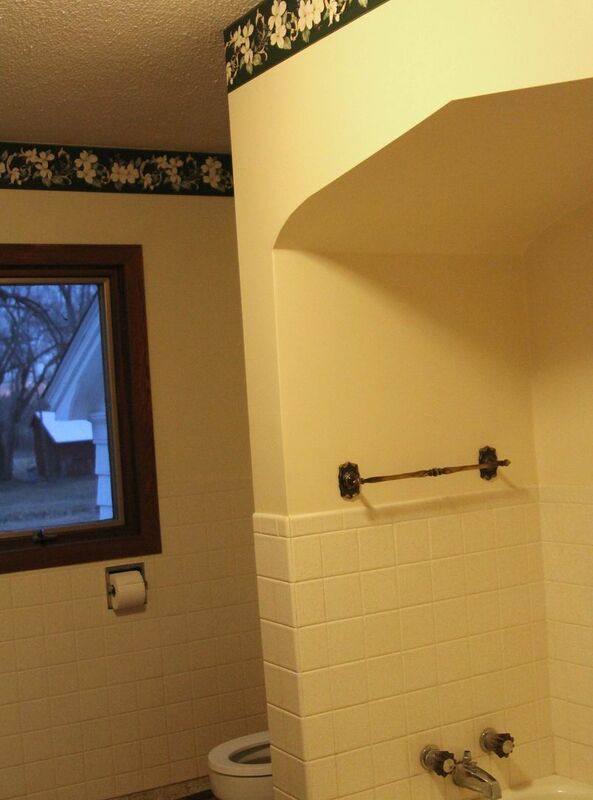 Two things: 1. lose the towel ring in the bathroom and put in a bar instead -- the towels will dry faster. 2. What brand are those cabinets in the kitchen? They look a lot like the Mutschler (sp.) cabinets my parents put in when they built the house in 1959 -- recessed hinges, beveled edges, low profile fronts. The only thing we've had to do is replace a couple catches in the kitchen. I do love those crystal door knobs though. I wish I could put those on every knob in my house! Needs some updating, but I like it! The exsisting cabinets aren't a real "brand." They were just built from scratch. They are built in to the kitchen, and the big vanity in the bathroom is built in as well. That makes it a bit tougher to update things, but we'll do it! I love the house...the wallpaper border is a NO...I love everything else. Look at the move as an exciting adventure and making memories. I'll send my muscle men to help!! hA!! The woodwork it beautiful!! Moving is always exciting to me...gives me a fresh start and a new canvas to create with! I love the room with the french doors! Who gets that room? I have a friend who had a room like that and it became the toy room- with curtain, of course. Looks like a little it of work, but amazing! :) I think you should ebay that rose lamp. Not my thing by any means, but I know a few people who would think that was fabulous! I love the cabinets. I keep hoping to come across a set someday. I like the big, flat doors - easy to keep clean and simple - and the latches. There was a set in an apt. we lived in that got torn down after we moved out (not b/c of anything we did! ), wish I had known for salvage! 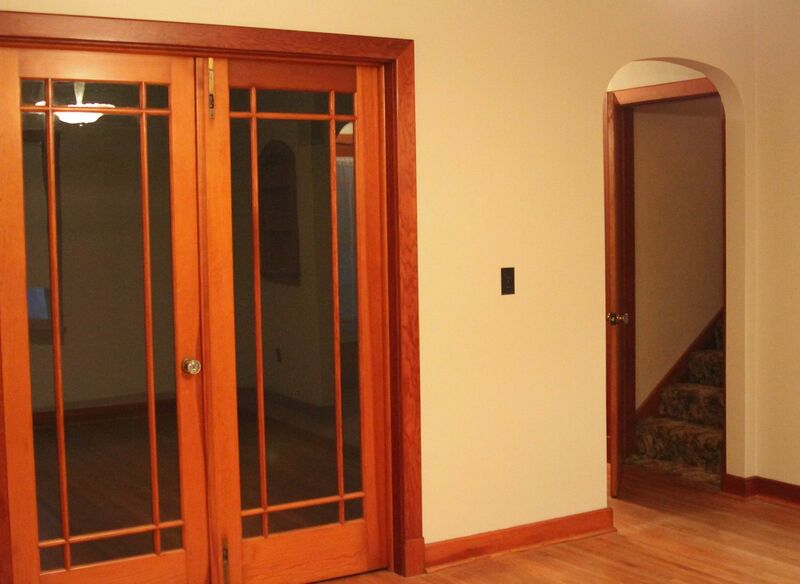 The glass french doors lead from the dining room into the "parlor", which will be our living room. There's a full basement, so the kids and their toys are going down there! i bet your new kitchen will look awsome but i do like you rose lighting i will take (: best of luck. it looks so nice without stuff on the counters!! You have some great stuff to work with in that house! Looks like a fun project. But I am right there with you on the pain of moving. I have moved far too many times. If I could do it all over again, I'd stay in one house forever. :-) Sigh. But, we didn't always have a choice so we do what we have to! Call me crazy, but I'm really excited for you! I know what it's like to move into dream surroundings. The pain of getting there is shortlived. Obviously some cosmetic changes needed (do not keep the wallpaper please! ), but great "bones" there for sure! Love the wood and those crystal doorknobs! No doubt moving is rough...it looks like a great space, though, and it will be so fun to see what you all do with it! OoooOoOOOoOooohhh, I would LOVE to have your house as is! Ours is falling down and apart around us (literally) and we just can't afford repairs like it needs. I so LOVE the woodwork in your house... and the sunshine from those kitchen windows, yes!! I would LOVE to have that counter space in my kitchen! Really like that chandelier... and the french doors! We bought a fixer house in 08 and it has been the best famiy fun we have had. (fixing it up). Teen boys can do great demolition! It is a process. One project at a time. You will love it. I promise it will be worth the moving! What an exciting time for you! I agree that the kitchen cabinets and bathroom are in dire need of updating. LOVE the crystal knobs. BTW, does it say something strange about me that I actually like the pink flowered light fixture? 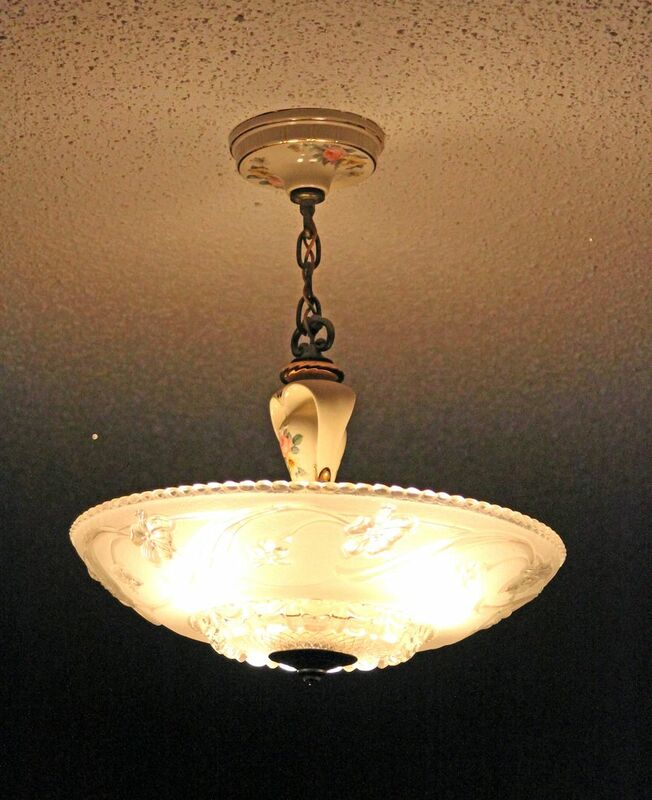 LOL> I love old light fixtures and all things vintage. 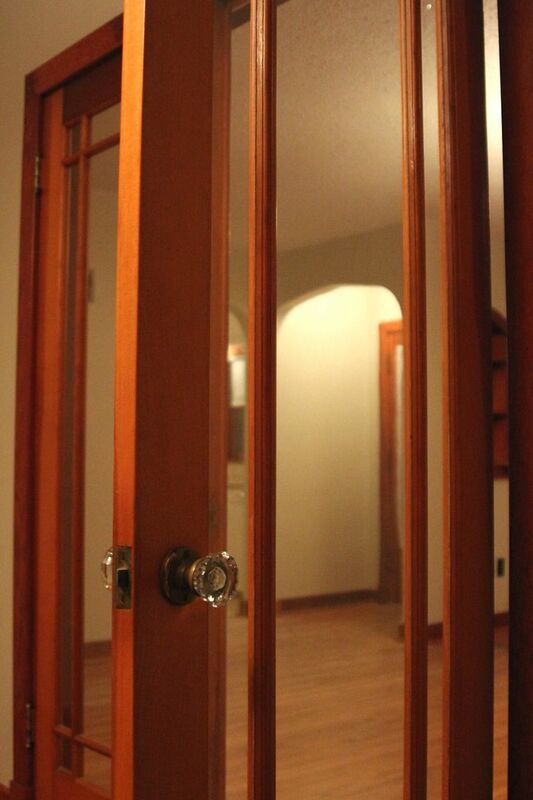 Love those french doors and glass knobs- I love your flips so i can't wait to see what you do with something for yourself!! Are you guys moving in and then doing the work or doing the work and THEN moving in?!?? ohhh girl, I hate moving too, but i am sure your new house will be the talk of the town...a new kitchen and old crystal knobs, swooning over here! Cant wait to see what you do! good luck! i actually LIKE the kitchen cabinets (they are just like ours) and the hardware on them. I also think the sparkly ceiling is fun. but that's from a weird kitchy girl who likes old things. Wow-looks like fun-I love to move and may be doing it myself soon-i am moving from 2900 sq ft to 1450 sq ft-a bit rough. I sure can't wait to see the after pictures-I am sure it will be beautiful. Have fun! 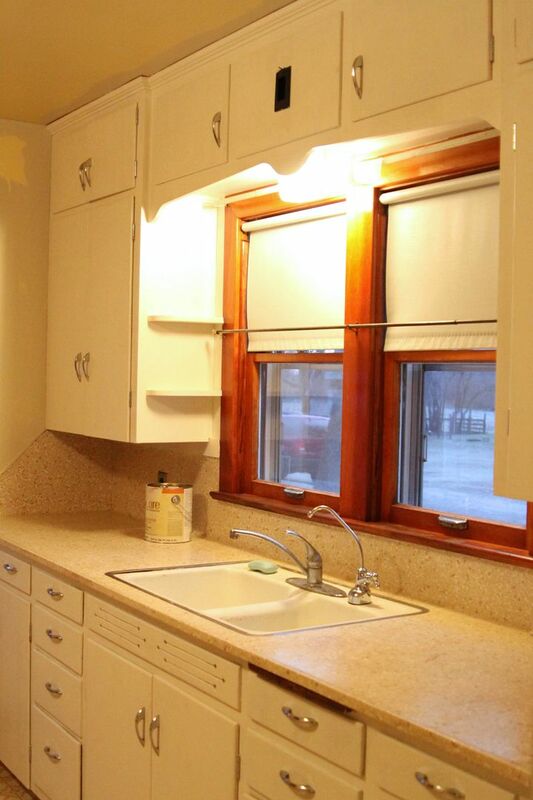 The kitchen cabinets actually look like the ones in my Great Aunts kitchen and this house was built in the 50's. It's so similar in set up just switched around. 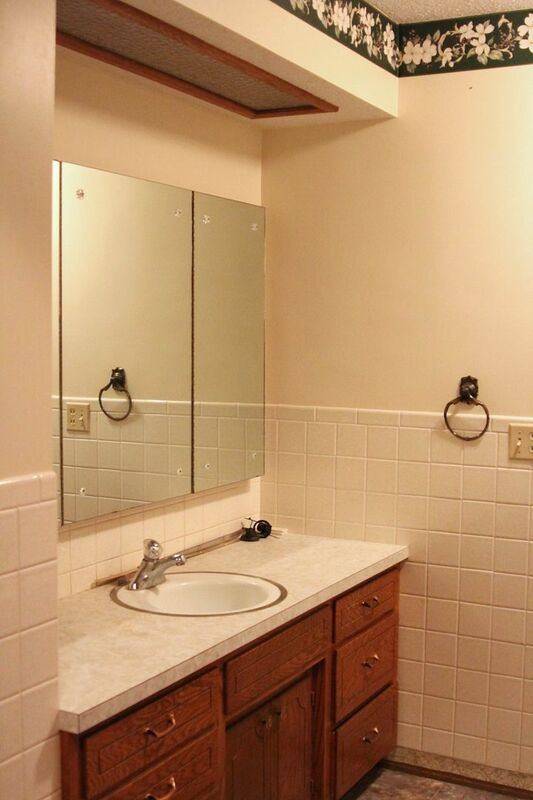 The counter top and sink here are totally different though. I found out our old neighbor built this house for my family back in the day!